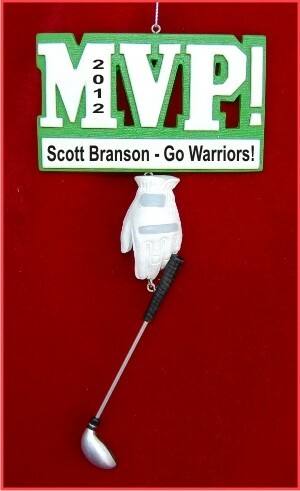 Any team golfer will appreciate being recognized with the MVP golf personalized Christmas ornament that makes a great gift for the team's best player or the golfer who means the most to you. Each of these sports ornaments personalized by Russell Rhodes artists arrives in a velvet gift bag with the information you want lettered as shown. The MVP golf personalized ornament is one of several in a series depicting many popular sports, and that makes shopping for the athletes on your list easy and fun.